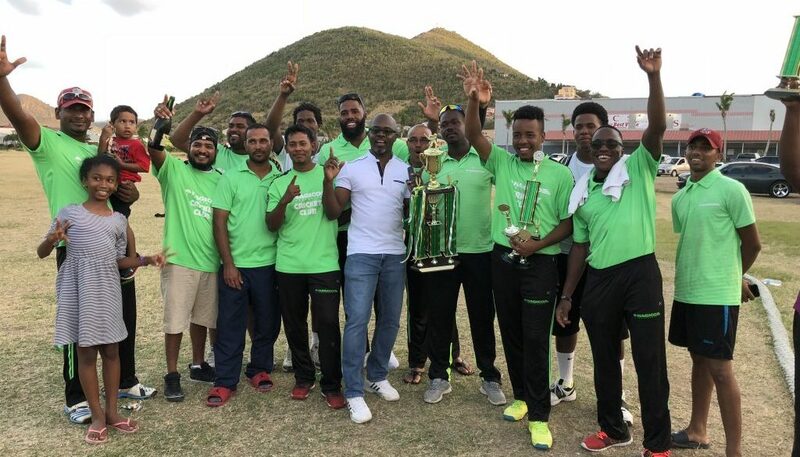 Cricket St. Maarten T20 Tournament was won this time around by the Nagico Cricket Club after a long drought of losing to the Spartans who were able to put a string of wins together over the years. The Spartans were always the favorites to win with a number of players in that club that also plays for the Leeward Islands Team; K Carty who also played for the West indies under 19 team when they won the world cup in 2016 is one of the team members. The finals began with the Nagico club batting first and scoring 147 off their 20 overs which is a par score for the type of wicket the Carib Lumber pitch normally produced. Gabrel top scored for Nagico with 33 followed by M Le Blanc with 30. Best bowler for Spartans was A. Charles who picked up 2 wickets for 28 runs from his allotted 4 overs. When it was time for Spartans to chase what looks to be a reachable target, they began looking very much in control with Carty at the crease and scoring freely but when he was gone for 64 they began struggling to keep up with the required run rate to reach their target. They eventually fell short of the 148 to win by scoring only 126 for 6 off their 20 overs giving Nagico the win by 22 runs. Top scorers for Spartans were K. Carty with 64 and K David with 23. Credit to R Doodnath of Nagico, with an incredible spell of 3 for 11 off his 4 overs and supported very well by L Richie who picked up 1 for 18 off his 4 overs.